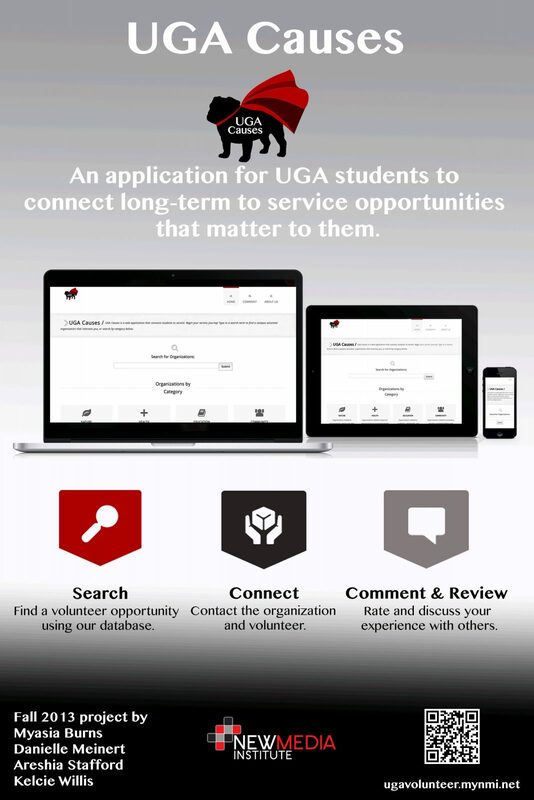 UGA Causes is a web application that connects students to university service organizations. The website connects inspired students to the campus volunteer organizations that best fit them– all by using simple keyword search, interest categories, and organization names. The website is unique to other volunteer search engines because of its focus: The University of Georgia has over 50 service-oriented organizations. Many students seek information about ways to improve their community, but do not know where to start. These same students often don’t have the transportation to partner with distant Athens volunteer organizations. Or if they do find a relevant group for them, they do not know how to stay involved. UGA Causes solves these problems to inform, inspire, and make service convenient to students. After students learn about organizations’ missions, events, and participation requirements, they can use the contact information to begin volunteering. The UGA Causes journey continues after this initial contact: users interact with the web app through social media capabilities. Users can comment on their experiences with organizations and interact with other UGA students using Facebook integration.